Every year the desert blooms a riot of beautiful colors, but the moment is brief and it fades quickly. We wanted to make sure this year, that we could capture some of that exotic desert beauty before it faded. We've been planning this session for months! The weather was toasty (for winter) back in January and we thought for sure our flowers would appear by February. But Arizona weather is tricky and February was cold and our flowers were delayed until March. Needless to say we were ecstatic when we finally found this little slice of heaven and could complete these long awaited sessions! One of our favorite things about Ali is the creativity she brings to each of her sessions. We loved all the details her and her mom put into this session, from the carefully selected dress, the flowers in her hair and her sweet desire to add a crown of wildflowers to her session. Her innocence and kindness really shone through in this session. 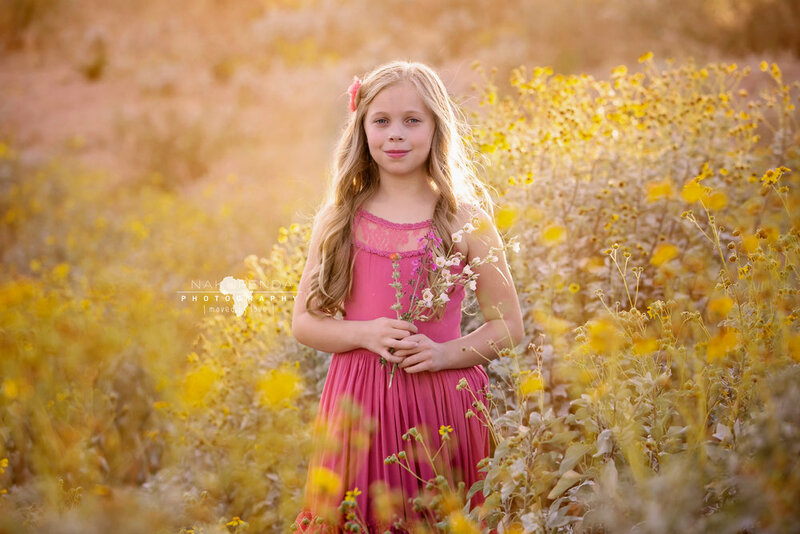 "We loved our wildflower session with Katie. She was able to capture beautiful light and flowers in an unexpected location. My daughter had so much fun romping through the flowers in her pretty dress. Katie always entertains my daughter's creative inspiration which makes the whole experience even more special. We will definitely do this session again next year!"